Halle (Saale)- the birthplace of George Friedrich Handel. The second largest city in the German state of Saxony-Anhalt and representing the second half of the metropolis Leipzig-Halle, which has 100,000 of the metro’s 600,000 inhabitants as well as one of the most renowned universities in Germany. Yet when you get off the train in Halle, you may be turned off by the ugly high-rise buildings that date back to the days of the German Democratic Republic, a communist state that existed until the fall of the Berlin Wall in 1989 and German Reunification in 1990. Yet when you walk further towards the City Center, you will see another face of Halle that will sweep you off your feet: architecture dating to the Baroque Period, a statue of Handel overlooking the Cathedral and the Town Square, and further towards the Saale River, there’s the Giebichenstein Castle and the Halle Zoo, one of the largest zoos in the eastern half of Germany (Neuenbundesländer). Surprisingly, if you are a pontist, you will be surprised to find that Halle has a wide selection of historic bridges that exist along the Saale River, its tributaries and to the south, the White Elster River, which meanders through Leipzig enroute to the Vogtland region in Thuringia and Saxony. There are 131 bridges in and around Halle; 14 of which are declared historically significant and protected by state preservation laws. 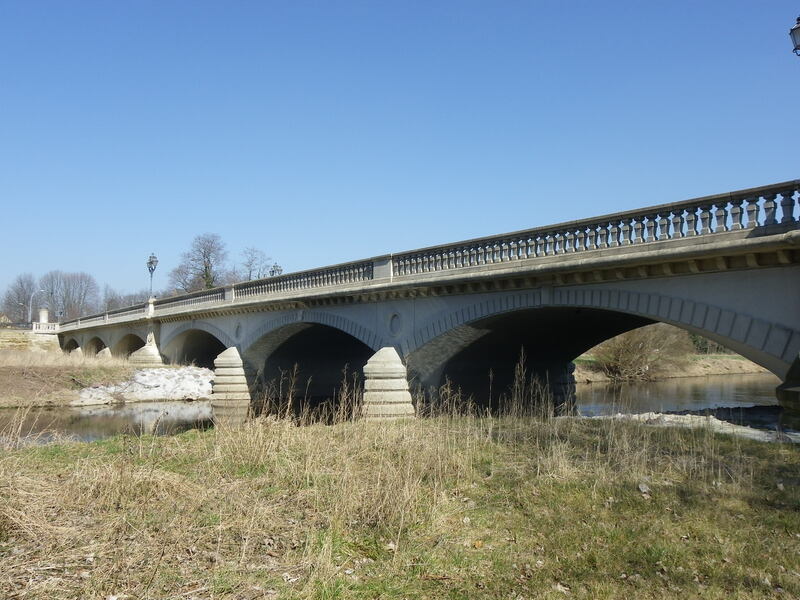 It is very rare to find historic bridges of at least four different types, or until recently have more than one cantilever truss spans, dating back to the 1880s. And in terms of German history, many of these bridges survived the test of time, including World War II, in contrast to the majority of cities and regions, whose bridges were severely damaged or destroyed through air raids and attempts by the Nazis to fend off advancing Allied troops. This plus the history that is still being sought on these bridges is what makes the bridges of the City of Salt unique. 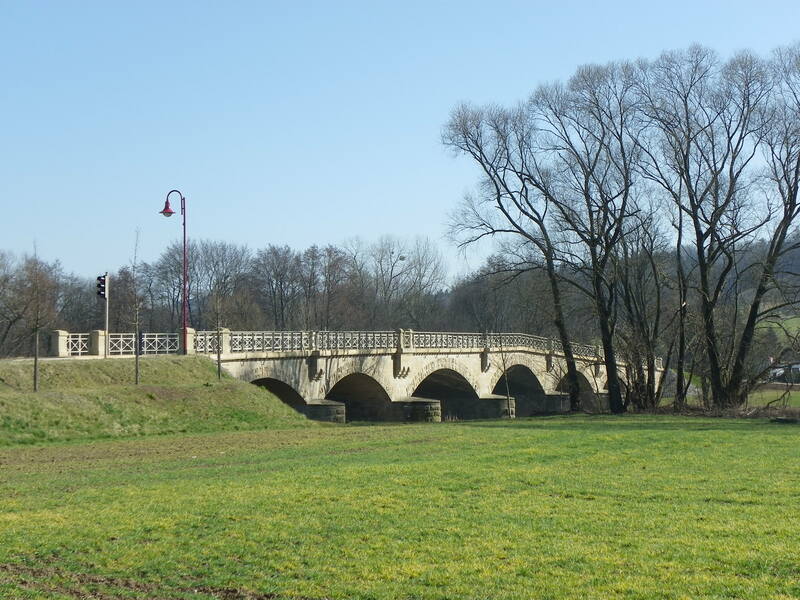 This bridge, built in 1733, is the last crossing along the White Elster before it empties into the Saale River in the Hallense suburb of Böllberg. It used to serve a main trading route between Merseberg and Magdeburg before it lost its importance because of the railroads. 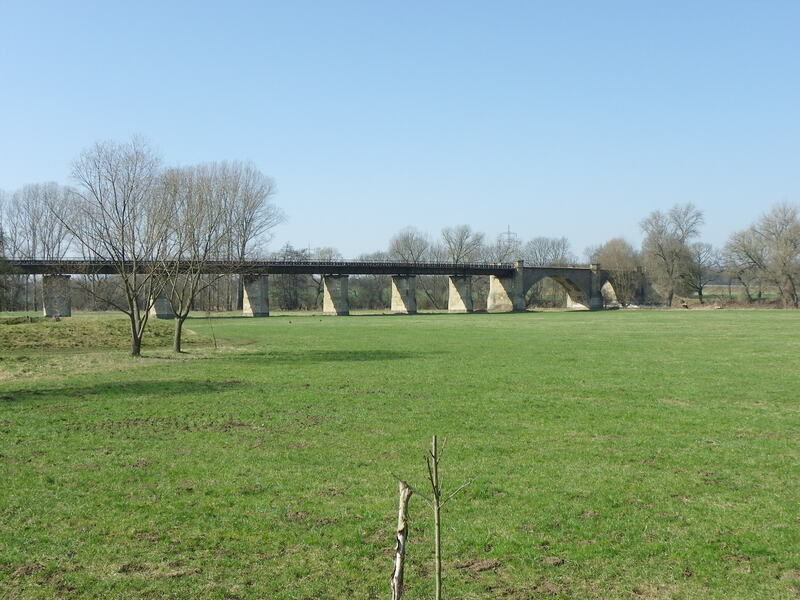 Today, the stone and concrete arch bridge serves the White Elster bike trail between Halle and Leipzig. Yet the bridge has seen its better days as the arches have deteriorated to a point where reconstruction is badly needed in order to avoid the structure to collapse. Spanning the Saale River in the southwest end of Halle, this eight-span stone arch bridge is one of the longest of its kind in the city, as well as the oldest. Most likely dating back to the late 1800s, this bridge used to serve an InterCity train line connecting the city with Kassel and Cologne. Thanks to privatization, combined with the realignment of long-distance rail lines, the bridge now serves regional services to Sangerhausen, Halberstadt and Nordhausen, enroute to its original destination. The bridge is one of the hardest to reach for a photographer needs to fight trees, thorns and tall grass before reaching the east bank and the bridge itself. With a total length of 8.5 kilometers plus two more for a branch to Halle, the ICE Saale-Elster Viaduct currently holds the title of being the longest railway viaduct in Germany. Completed in 2013, the viaduct features concrete box girder spans crossing the two rivers and swamp areas nearby but also features a steel through arch span that spans the branch that breaks off the main route to Halle. Although it passes the village of Schkopau (and with that a 1936 railroad truss bridge spanning the Saale just a kilometer south of the bridge), the viaduct is part of the ICE line connecting Erfurt and Leipzig, which since its opening in December 2015, has cut down the travel time by 60% to only 30 minutes between the two cities. The record will remain until 2017 when another viaduct located south of Erfurt will open, which will be longer than this one. 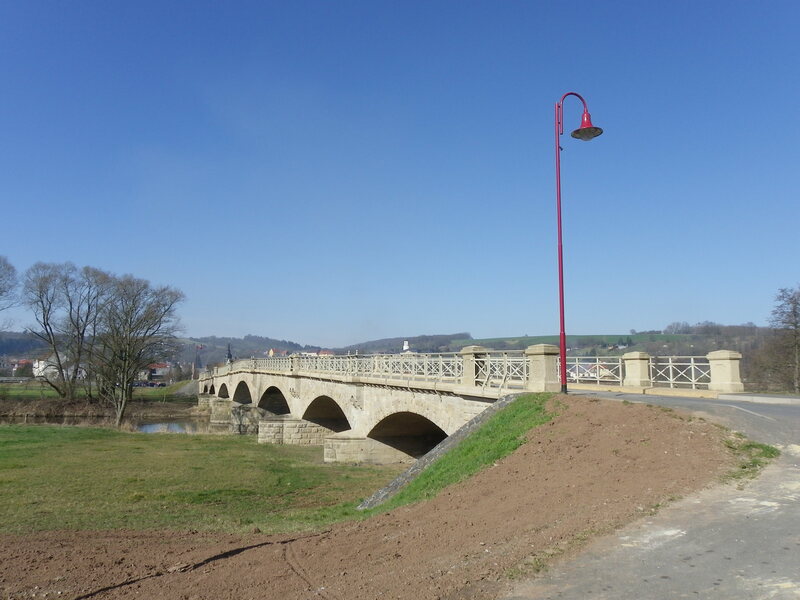 This is the second youngest bridge in the city and the youngest to span the Saale. This bridge spans the Saale’s main river at the entrance to Rabeninsel (Raven’s Island) and features a cable-stayed bridge, whose pylon angles towards Böllberg Weg and the cables support the roadway. The roadway resembles a raindrop as it encircles the pylon. Built in 2000, the bridge measures 85 meters long and is 20 meters tall, easily seen from the main highway a kilometer away. 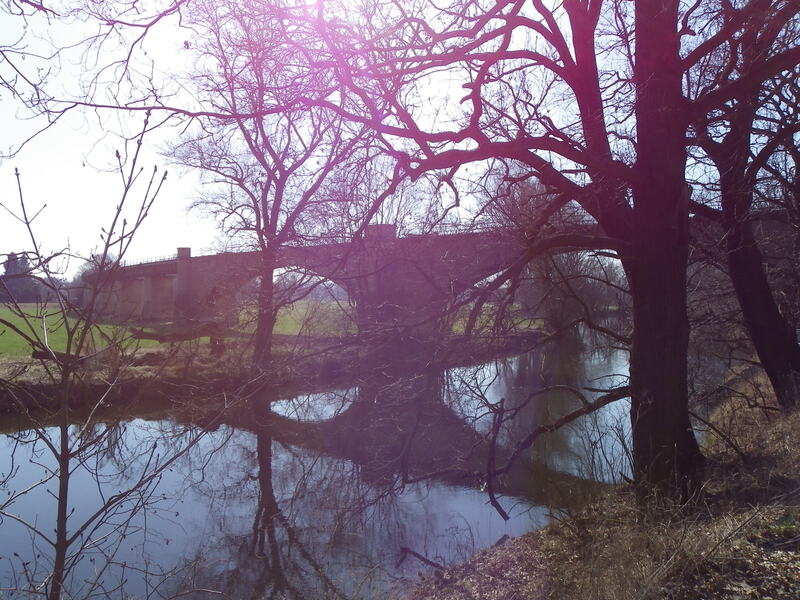 A few months ago, the Chronicles did a segment on this mystery bridge, spanning the Saale River at the confluence of the Elisabeth Saale and Middle Saale Rivers, west of Böllberg Weg. This bridge was built in 1884 and used to serve a rail line connecting the city with Magdeburg (north) and Merseburg (south) for over 80 years. When the line was abandoned in the 1970s, the lenticular through truss span, measured at 40 meters in length, was rehabilitated and converted into a bike and pedestrian crossing, which still serves its function today. The bridge also has a dark side- and a memorial plaque is placed on the truss as a marker of this tragedy. In the night of 13-14 March, 1919, Karl Meseberg, who was a revolutionary leader during World War I, was murdered on the bridge with his body landing in the Saale. It was found five days later. While the bridge shows its bright side during the day, at dusk, one can feel the presence of a ghost at the bridge, keeping people away from the crossing. This may be in connection with this unfortunate event, but more info in the form of eyewitnesses and evidence is needed to confirm the claims of a ghost at the bridge. If you look to the south of the bridge, you will find a blue tied-arch bridge about 100 meters away. That bridge was built in 2000 and carry water lines connecting the southern and western parts of the city. This steel through arch bridge is located over the Saale River at William Jost Strasse north of the Hafenbahnbrücke. Built in 1912, the grey-colored span is similar to the Hollernzollern Bridge in Cologne in terms of the design of the bridge, but the portal bracing resemble a bridge located west of Steinbrücke in neighboring Magdeburg. But when passing underneath the bridge, one will see the stone arched approach spans carrying the emblem of Halle on there- an impressive construction by the builder of the bridge, whoever it was. 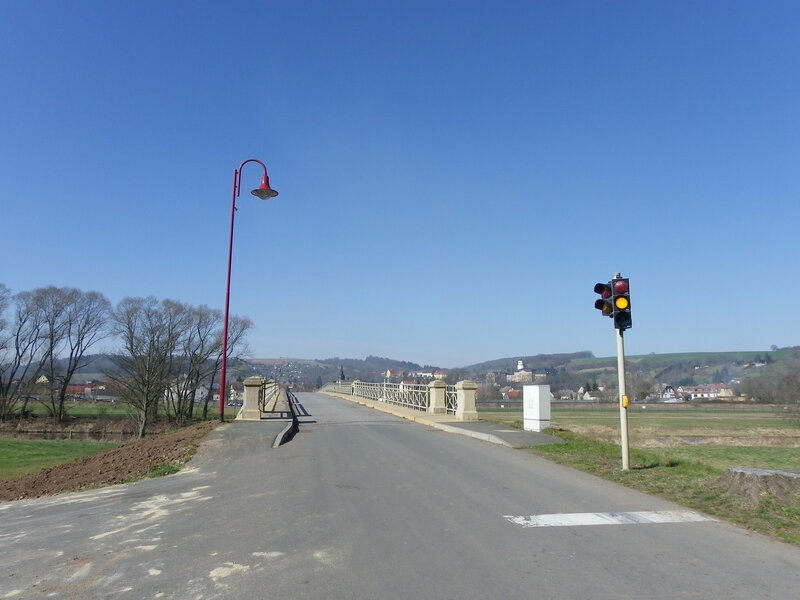 Spanning the Saale River at the Mansfelder Strasse, there are three crossings located within 60 meters of each other. The oldest span is a polygonal Warren pony truss with riveted connections that used to serve streetcar and vehicular traffic. Yet because of its structural obliqueness- too narrow and too light to support traffic- a vehicular crossing to the north was built in the early 1990s, which was followed by a separate streetcar crossing to the south a decade later. The truss span was later converted to pedestrian use by strenthening the trusses and adding a concrete and brick deck. An economic and interesting way to preserve a piece of history. Apart from the Hafenbahn, Giebichenstein, and Mühlentor Bridges, the Peissnitz Bridge is one of the crown jewels as far as Halle’s bridges are concerned. Spanning the Saale River at Peissnitz Island, carrying the street carrying the same name, the bridge is one of the most ornamental of bridges, for the 1898 structure features a cantilever Pratt truss design, with ornamental towers supporting street lights, and red quarry stone arch approach spans, presenting its grey and red colors which are typical colors of the city. When built in 1898, the bridge was the only toll bridge in the city, as money was collected for people wanting to cross the bridge and enter Peissnitz Island. This was discontinued in 1921 and the bridge has operated as a free bridge ever since. The bridge is 103 meters long, 70 meters of which represent the main span. Despite sustaining damage during World War II, it was rebuilt in 1946 and was eventually converted to a pedestrian and bike crossing, which remains that way to this day. The Peissnitz Bridge, located on the east end, is one of three bridges that provide access to the island, along with Schwanenbrücke and another bridge at the west end. The latter, built in the 1900s, was recently replaced with a steel truss bridge in 2013. Located at Weinberg at the northwest end of Peissnitz Island, this 1893 bridge is one of the oldest standing in Halle. The structure features a wire suspension span with eyebar connections found at the steel towers. Its roadway features a Town Lattice truss design railing which together with the suspenders, support the wooden decking. The bridge was destroyed during World War II but was later rebuilt in 1946. It was renovated in 1992, which includes dismantling, sandblasting and improving the steel parts, and reerecting the span on new abutments made of brick and concrete. The abutments feature the name Schwanenbrücke on there. The bridge is open to cyclists and pedestrians wishing to enter the island from the northwest. The bridge is next to the island park railway station, which provides service to places on the island. Spanning the Mühlgraben at Peissnitzstrasse, this 1912 closed spandrel arch bridge has some unique features making a stop a necessity. Like the Pfälzer Bridge, the railings feature a Howe truss in an Art Deco design, all in concrete. Two pairs of cast iron lanterns, encased in concrete, decorated with gargoyles, can be found on each end of the 20 meter long span, which provides the lone access to Peissnitz Island and park area to the west, let alone the Peissnitz Bridge itself. The bridge was named after a water mill, located nearby that was built in the late 1800s and was made of stone. That mill still exists today. This bridge and neighboring Giebichenstein Castle on the lime cliffs of the Saale River go together like bread and butter. The three-span concrete arch bridge is the fourth crossing at this site, being built in 1928 replacing a steel Parker through truss bridge, whose predecessors included a pontoon bridge, ferry and a covered bridge. The bridge is 261 meters long, 60 of which consist of the largest arch span. The bridge features two sculptures on the south side facing neighboring Peissnitz Bridge, resembling cattle- making the bridge a real treat to see. The bridge was renovated in 1995 and again in 2011, but continues to serve vehicular and street car traffic connecting the city center with the western suburb of Krollwitz. 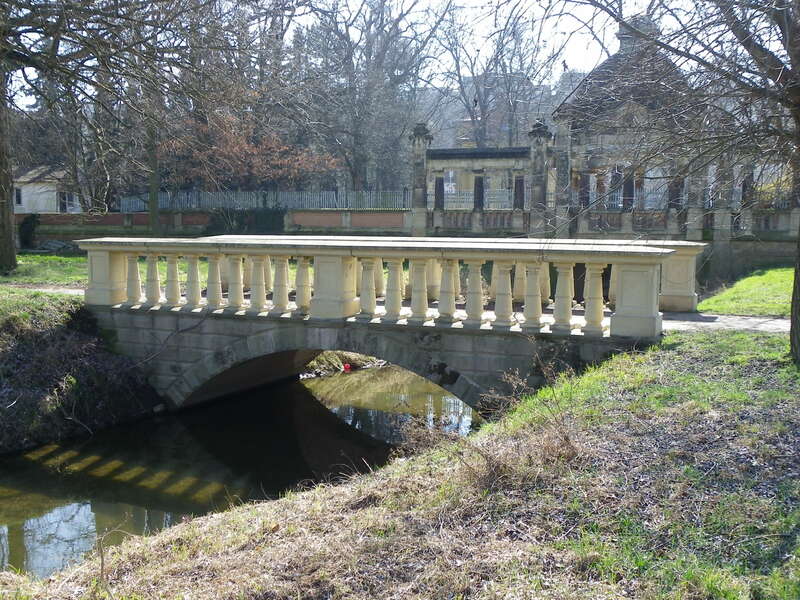 Like the Peissnitz Bridge, the Pfälzer Bridge, spanning Mühlgraben-a tributary of the Saale- at Neuwerk in the northern end of the city, is the most ornamental bridge but in the form of an arch bridge. Art Deco art on the bridge’s railing and four lamp posts can be seen when crossing the 1912 span by car or bike. The railings resemble a Howe truss made of concrete, a rarity one can see these days. Located at the Robert Franz Ring, this Mühlengraben crossing is one of the newest bridges along this route. Little has been written about this bridge except for the fact that the steel deck arch span appears to date back to a time span between the 1990s, going back to the 1940s. In either case, the bridge’s lean appearance is attractive for many bridge photographers who enjoy a few minutes with the camera. 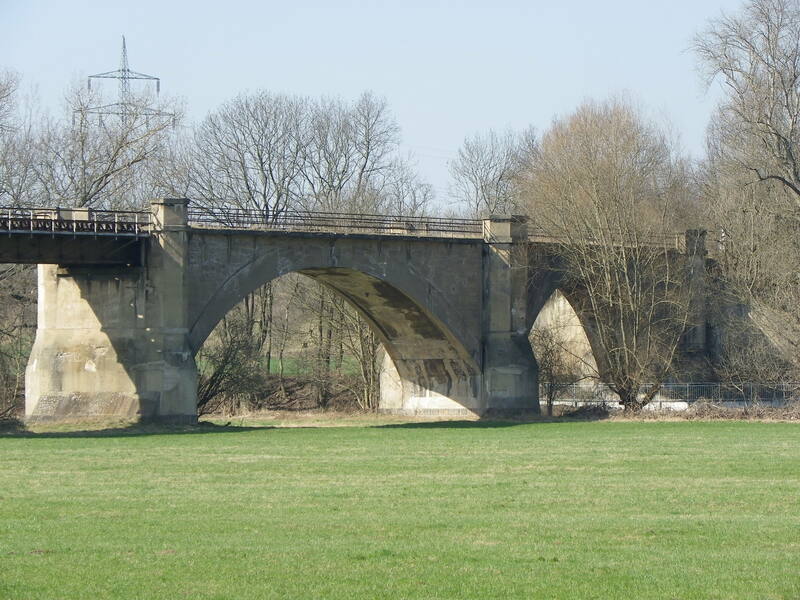 When leaving Halle (Saale) by train heading north, this bridge will be the last landmark to be seen on your way out. Today’s bridge, built in 2005, features a cable-stayed span that is 71 meters tall and 171 meters long, spanning the railroad tracks. Yet the bridge came at the cost of a steel eyebar suspension bridge with pony truss decking, which was built during the first World War, with the help of French soldiers. It was originally named the Hindenburg Bridge before it was changed after World War II. Despite being considered a historic landmark, excessive rust and corrosion, caused by diesel-powered trains passing underneath it, doomed the bridge, causing the city council to decide for a replacement span. The cable-stayed bridge was built to the north of the bridge and after its completion in 2005, the 1916 bridge was dismantled and sold for scrap, despite protests by many who wanted to keep the structure for reuse as a pedestrian bridge. Halle (Saale) is famous for many markets and events honoring Handel and other music greats. This includes the Christmas market, which you can click here to read about. Courtesy of sister column The Flensburg Files. There is a philosophy pertaining to visiting a town that makes tourism unique and interesting: Always look for the most uncommon and unvisited places first before visiting the main attractions. They have the most valuable information and features that will make you leave town knowing a bit more than before. And while I was there for an interview for a teaching position at an international school, I was reminded of the philosophy mentioned at the beginning, when it came to relics of the past. While the community was once a pub for the textile industry, it also has a set of historic bridges that are worth visiting. One of which was a viaduct spanning a street and valley, which provided a spectacular view of the northwestern end of Glauchau. Once crossing that enroute to the interview and realizing that I had a long waiting time to catch the returning train to Jena in Thuringia, it became my mission to see what other bridges are worth the visit. And sure enough, enough diamonds in the rough were discovered, which were enough to justify constructing a tour guide showing the readers where these bridges can be found and thus encouraging people to visit them in addition to the town’s historic city center. A map and link to a gallery of photos can be found at the end of the article. When arriving at Glauchau Railway Station from Dresden and Chemnitz, this bridge pairing will greet you, as you cross Lungwitzsbach Creek and the parallel street leading to St. Egedien. Both structures are at least a century old, but each one having a different design and built using different materials. The sandy grey structure with dark brown arches is the most heavily traveled and also the oldest of the two, having been built in the 1860s and is part of the magistrate connecting Dresden with Zwickau and Hof. The bridge has seven arches and and each spandrel is partially closed, for half-circle openings appear, one on each end of the arch. The bridge appears to have been rehabilitated between five and ten years ago, with the line being electrified and the bridge strengthened to provide more trains along the line. One can see the work with the concrete shelves sticking out between the arches, where each overhead pole sits. The sandy brown colored bridge next to it features a three-span open spandrel arch bridge, totaling three spans. The spandrels have an arch top- for each arch span, there are three spandrels on each side. 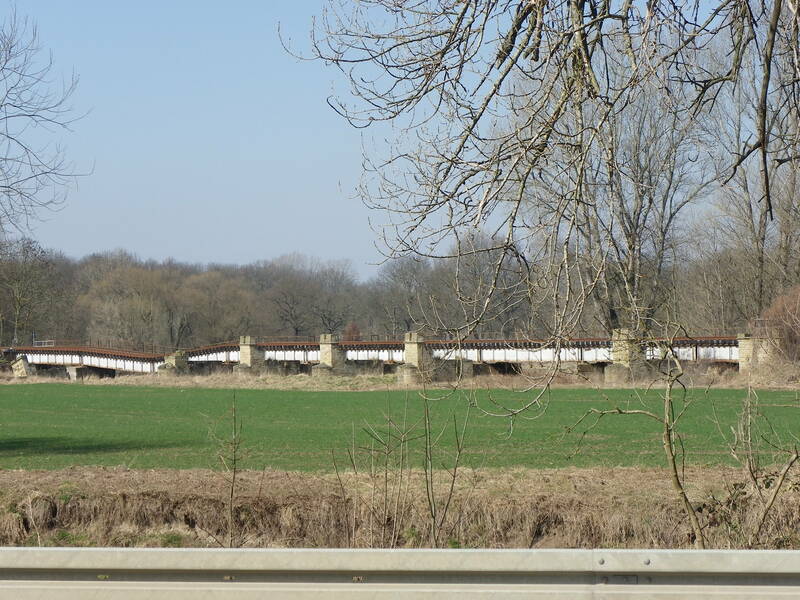 That structure only serves freight traffic although it had previously served a railway line along the Zwickauer Mulde, connecting Penig, Rochlitz and Grimma. Both bridges are about 200 meters long and have two tracks each. It is unknown who was behind the design and construction of the two bridges, but they are considered the longest in Glauchau and ones that are a must-see when spending time there. Spanning the Zwickauer Mulde River, this bridge is the nearest of the two arch bridges to greet passengers when entering Glauchau Railway Station from the west (Erfurt, Meerane and Zwickau). This bridge is the gateway to the industrial park, where automobile parts are produced for Volkswagen, whose production facility is located between Glauchau and Zwickau. The structure features three closed spandrel arch spans, the longest (which spans the river) is built using limestone and is about 80 meters. The side arches are built using sandstone and limestone, thus creating a unique color and pattern combination. Each of the spans are about 30 meters, one of which crosses the street. The bridge is the most difficult to photograph because three fourths of the structure is on private property and is fenced off. The last fourth features trees, tall bushes and no sidewalk, thus the risk is great when photographing the structure, as you can see in the pics. The bridge is at least 120 years old but serves the magistrate between Dresden and Hof via Zwickau but also the line between Erfurt and Glauchau. This line is part of the planned Mitteldeutschland Route, connecting Chemnitz with Cologne via Erfurt, Kassel and Gera. It is expected that InterCity trains will start serving the line by 2023, thus making Glauchau a train stop for long-distance trains for the first time since 2006. 1. Pull into the parking lot of the beverage store, go into the Mulde, swim underneath the bridge and get a shot on the opposite end (as the front side has another bridge carrying a pipeline over it. Cross the street onto the flower bed of a nearby proprietor, walk the line along the curb bordering the flower bed (without stepping into it) and get an oblique shot from the building. Being dressed in a suit with no SCUBA equipment for a special occasion, I elected the second option, even though it would have been funny and interesting to try the first option. But the photo opportunity is well worth it. The current structure, built in 1955, is a single-span stone arch bridge, carrying a concrete decking. Given the scarcity of materials needed for bridge building because of the after-effects of World War II combined with the Soviet occupation of the eastern half of Germany, many of the new structures were constructed using concrete and/or with minimal quality and using either beam or truss structures. 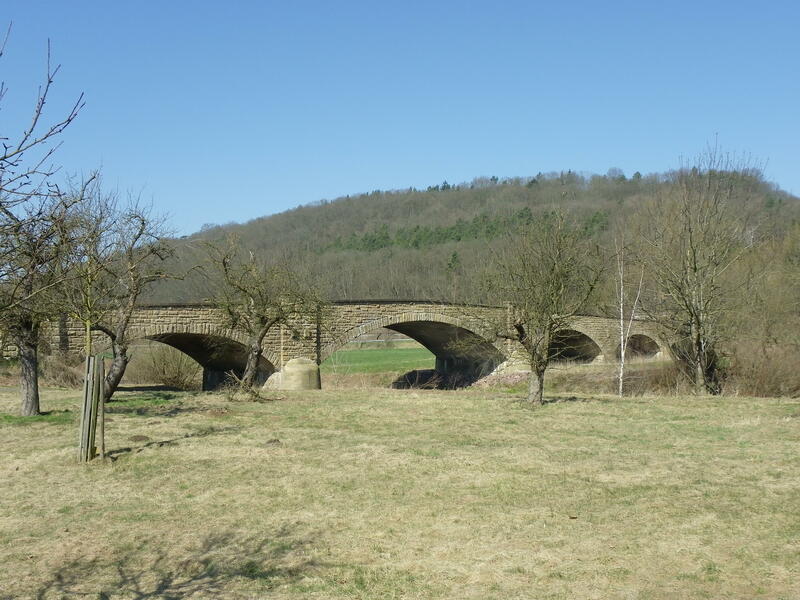 This bridge was probably built using stone bricks that originated from the Ore Mountains (Erzgebirge) and was cut on site to fit the structure that is 35 meters long and 25 meters wide. Its predecessor however consisted of a Parker through truss bridge built in 1888 and was, according to local historical accounts, one of a few Glauchau bridges built by Heinrich Carl Hedrich. The bridge featured riveted connections among the trusses, v-lacing on its overhead bracing and upper chords and a vertical endposts. 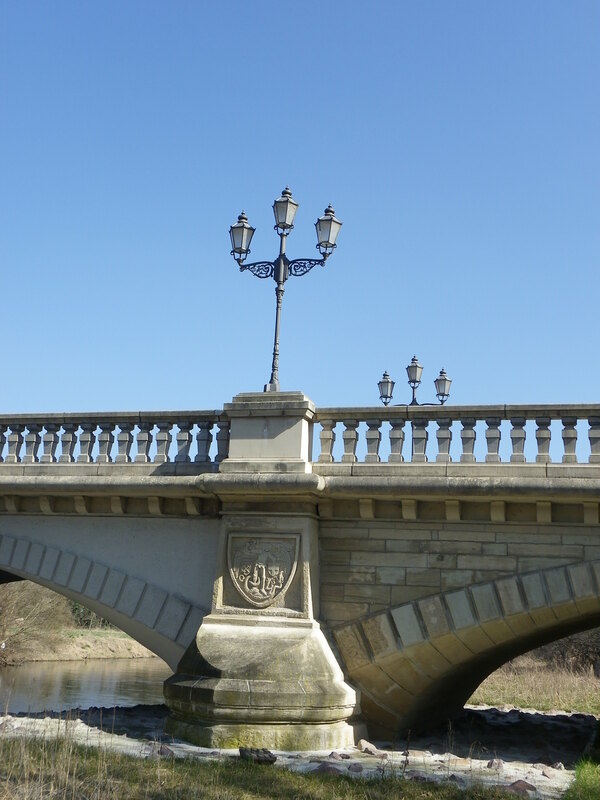 Also included were ornametal lampposts on both ends of the bridge, featuring spirals and spherical shapes with an oval-shaped glass cover for lighting. The bridge’s original wood decking was replaced in 1927 with a combination of concrete and brick to accommodate increasing traffic loads. 11 years later, a new coating of paint was needed, which kept the bridge from rusting and thus prolonging its lifespan. Sadly, even though the bridge survived two World Wars, it was closed to traffic in 1954 because of rust and corrosion on the trusses, including the lower chord. At the same time, plans for a new bridge commenced, which was realized one year later. The King Albert Bridge, named after the King of Saxony who was also the member of the House of Wettin, may be just a typical bridge for the City of Glauchau, yet never judge it by its appearance just by crossing it. The treasure can be found in the water, whose historic value will make the writer and historian think twice before writing it off as a typical piece of concrete over a body of water. 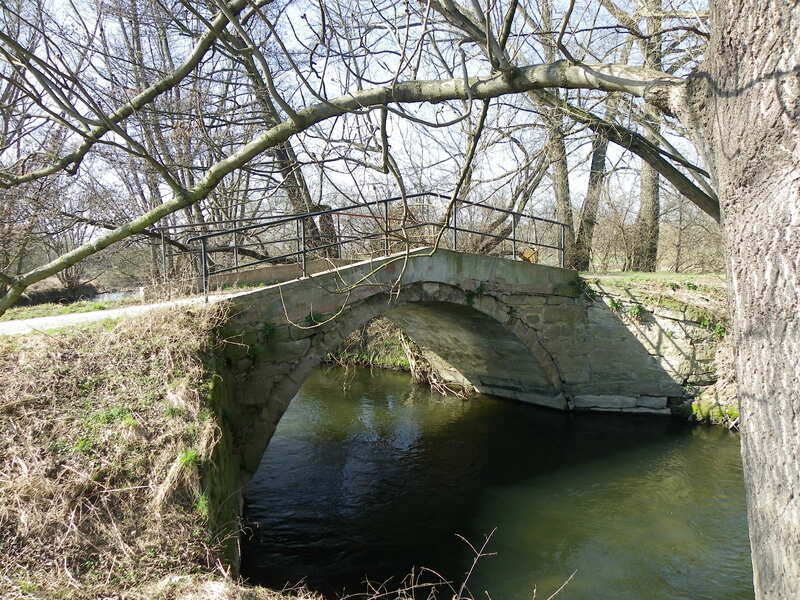 Located at the southeast end of Gründelteich pond near the Hintere Glauchau Castle, this bridge has been in service since the 1880s as it served as the lone access to the island. The history behind the island is that it was named in honor of Heinrich Carl Hedrich (1816-1900), who spent most of his life in Glauchau and left a mark in the city’s history. Hedrich was responsible for the rechanneling of the (Zwickauer) Mulde while reconstructing the dam that had been destroyed by flooding in 1839. Furthermore, he invented Germany’s first modern water main system running through the community, providing drinking water to the households, while also channeling water away from the Zwickauer Mulde. In addition to the construction of the mills and dams, Hedrich harnessed electricity through hydroelectric power. The people in Glauchau benefitted from his inventions, and Hedrich was awarded with a head statue and an monument with a golden angel in 1884, about the same time this bridge was built. The decking, railings and piers appear to be at least 45 years old, yet the design of the bridge is the same as the original built in 1884. The Meerane Strasse is one of two major streets that have bridges crossing the Mulde River and its diversion arm (Flutgraben). This bridge is located at the junction with Lindenstrasse and by first glance, one will see a typical 90s style concrete deck girder with vertical lining and orange railings. A rather bland structure unless you have a quick blick at the abutments of an older bridge on the right hand side going west towards the Flutgraben crossing. That bridge had a history of its own as it was a steel pony girder bridge with Town Lattice truss features. Ithel Town created this unique truss design in 1820 that consisted of interwoven diagonal beams. This truss type was common on many wooden covered bridges in the United States, but also among many metal truss bridges in Europe, especially those carrying rail traffic. The Meerane Bridge was constructed back in the 1880s and was claimed by historic resources to have been built by Heinrich Carl Hedrich. Yet the exact date of construction remains unknown. It is known that the structure, which was about 35 meters long and 15 meters wide, was replaced at the time of the Fall of the Berlin Wall because of age and structural deterioration. 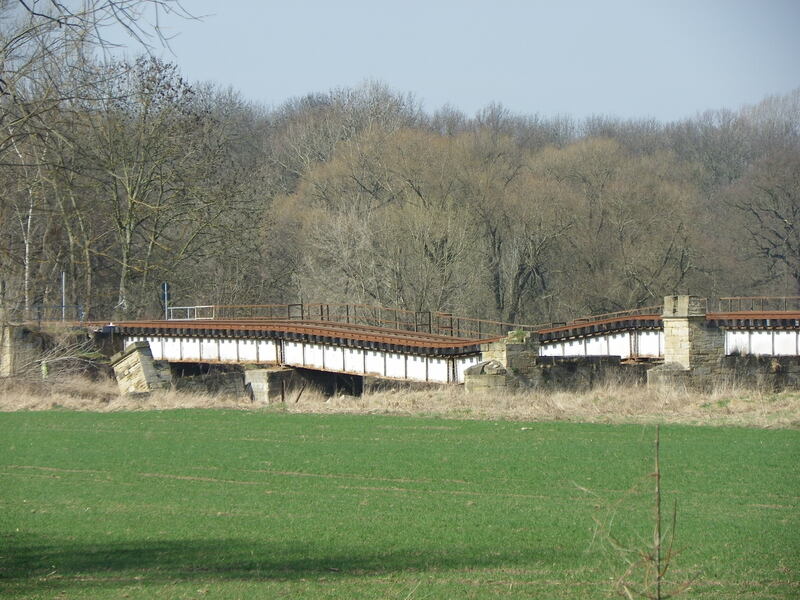 A concrete bridge was built alongside the old structure, thus allowing for the continuation of traffic between Glauchau and Meerane on the old one. After traffic was diverted onto the new structure, the old one was removed and scrapped. While Glauchau has eight bridges and a dam spanning the Mulde and its diversion canal Flutgraben, one unique feature that makes the city special are the bridges on the hill leading to its historic city center and castles. Dubbed as the Bridges to the Holy Land, each of the three spans consist of arch bridges crossing deep gorges that serve as drainage to the Mulde. Each of the gorges are approximately 20-25 meters deep. From the flood bed of the Mulde, the height of the bridges is approximately 75 meters high, and given the fact that Glauchau was once a walled city and it has a strong religious core- laden with a variety of denominations- one could christen the name of the bridges along Otto-Schimmel-Strasse and Leipziger Strasse between the train station and the castles “The Three Bridges to the Holy Land,” named after the Three Wise Men who brought Baby Jesus gifts and blessed Him on what it today called Day of Epiphany (January 6th). Yet that interpretation would be a bit far-fetched if one is either a non-denominational or an atheist. Even though one of the arch bridges no longer exists (Nicolas Tower and Bridge), all three bridges still serve it purpose of serving traffic and providing commerce to the city center. We will look at all three bridges going towards that “Holy Land”, beginning with the youngest and longest of the three. Spanning Talstrasse at Otto-Schimmel-Strasse and Leipziger Strasse, the Scherberg Bridge is a cross between modernitity and history as the 1920s structure features a concrete closed spandrel Luten arch main span and two circular mini-spans implanted in the wingwall on each side. Furthermore, Art Greco patterns can be seen in the main arch span. A shield representing the City of Glauchau can be seen on the east end on the right of the main arch span. Construction started in 1921, and despite two harsh winters, combined with a lack of personnel and high inflation upping the cost for the bridge because of the aftereffects of World War I and the Marseilles Treaty respectively, the bridge was dedicated on 29 April, 1923. The bridge was deemed a necessity because of the need to connect the city center and the train station, which was completed three years after the bridge opened. Prior to the bridge, accessing the city center was as difficult as Moses climbing the Mountain to meet God and receive the 10 Commandments. Delivery with horse and buggy had to be made by zigzagging up several streets and dealing with gorges and other obstacles. The plan for the bridge had been created in 1909 but work never commenced because of the war, plus hefty discussions regarding the necessity of the bridge. Despite all the aforemetioned adversities affecting Glauchau, the city mayor Otto Schimmel had the final word in favor of the bridge, which has a total length of 97 meters (the main span is 35 meters), 14 meters wide and 28 feet above Talstrasse. The bridge was rehabilitated in 2011, which included repairs to the structure, new decking and lighting and new paint- especially with the shield. The bridge may look just like new, but the 94-year old structure is one of the symbols that represent the city of Glauchau. The Scherberg Bridge serves as a posterboy for other arch bridges of this caliber that exist in the US and elsewhere, many of which are in danger of being demolished and replaced. The next bridge along the Road to the Holy Land is the Postbrücke. Spanning another gorge (which is accompanied with a path down to the residential area) carrying Leipziger Strasse, this masonry stone arch bridge is the shortest of the three bridges, having a span of 15 meters and a width of 12 meters. Built in 1887, it is located next to the historic post office, which had existed much longer than the bridge itself. Apart from some minor structural work on the bridge, the Postbrücke has maintained its historic integrity, while serving traffic between the city center and the district of Gottessack (God’s Sack), north of the structure. The area features several historic, but empty buildings that are ripe for restoration and reuse, making Glauchau even better than it is now. The last bridge going to the city center is the Nicolas Tower and Bridge. While no date has been pinpointed to the bridge, it was believed to have been just as old as the tower itself. The Nicolas Tower served as the main entrance to the city center, which had once been walled on all sides, with watch towers and the castles that were included. It is safe to say that the entrance to the walled town was through the Hintere Schlossbrücke on the south side (still extant) and the Nicolas Tower and Bridge on the north side. While the tower may have been built during the Medieval era as part of the project to make Glauchau a walled city, records indicated that the tower was rebuilt from the ground up in 1741. It featured a living quarters above the gate, where the watchman and his family lived, and was later decorated with a church bell by the Lord Albert Christian Ernst in 1758. A clock was later added to the gate. Because of its narrowness combined with the increase in traffic and damage caused by lightning and high winds, the tower was replaced in 1890, but the bridge itself remained in service until 1965. A mural depicting the tower can be seen at the site where it once stood as you cross the bridge, yet a mini-replica can be found in the city museum. The Nicolas Bridge featured two different arch bridges- one made of concrete and one made of brick, whereas the former may date back to the time of the castle and the brick span was later added in the early 1800s. The bridge also featured a series of steps to encourage people walking along the path along the creek to use it to go to the bridge and the city center. Sadly, due to structural damage caused by bombings in World War II and later deterioration because of the increase in automobile traffic, the bridges had to be demolished in 1965. The older arch was first removed, followed by the other arch as soon as the replacement structure was in place and opened to traffic. It is hard to believe that, despite looking like a bridge built in the 1990s, today’s structure is 52 years old. But part of that was because of the rehabilitation work done in 2003-4 to keep the 33.3 meter long bridge open to traffic. Its width of 19.6 meters include 6.1 meters for pedestrians, and its height of 9 meters above the gorge provides viewers with a glimpse of the gorge and the valley of the Mulde, filled with houses and green landscape. The bridge provides good commerce as many stores line up along the street between the bridge and the Postbrücke, but also towards the city center. The Waldenburger Viaduct is one of three stone arch viaducts serving the rail lines passing through Glauchau. All of them appear to have been built in the 1860s as the rail lines between Glauchau and Werdau were established. This bridge features three arch spans- the center for vehicular traffic, the outer for the cyclists and pedestrians. With the renewed electrification of the line in the early 2000s, this bridge was renovated as part of the plan to reintroduce InterCity trains between Chemnitz and Cologne via Jena, Erfurt and Kassel. By 2023, InterCity trains are expected to stop in Glauchau from Hof (South), Dresden (East) and Cologne (West). Until then, passengers have only the regional trains connecting the town with Meerane, Gößnitz and Gera to the west as well as those going to Zwickau and Aue to the south and those going to Chemnitz and Dresden to the east, to contend with. But subtracting that, the bridge is one of the nicer structures to visit while in Glauchau but one that stands out in the face of buildings that are victims of either neglect or modernization. If one can detect this bridge early, it is not a miss. Otherwise, it is drowned out by these factors. Located behind the Wehrdigtschule, this bridge is an easy miss if one goes past it along Lindenstrasse. But its history dates back to the 19th century, when the establishment of factories and residential areas to the west of town necessitated the need for crossings over the Mulde. This crossing was one of four that were built under the direction of Hedrich (the same person responsible for the modern water main lines, mills and the dam), but six additional ones were built after the turn of the century. While the original crossing was most likely destroyed in World War II, this bridge took its place many years later. Between 15 and 25 years old, this wooden Pratt truss bridge is quite modern for a covered bridge but one that gives the nearby schools at Wehrdigt and the Saxony International Elementary School some charm, especially as children and teachers can utilize this crossing for safety and receational purposes. Located at the southern entrance to the Hintere Glauchau Castle, this five-span concrete and stone arch bridge spans a deep valley and judging by the appearance, is perhaps the oldest bridge in Glauchau, having been built at the same time as the castle itself in the 17th Century. The structure was needed to provide passage into and out of the castle, while the valley floor used to be a moat, used to keep intruders from attacking the castle from the outside. Today’s bridge serves pedestrians, but given its appearance, it would cause an American bridge builder to sound off the alarm regarding structural deficiencies, calling for the demolition and replacement with something resembling a bridge at Walt Disney World in Florida. Fortunately, engineers recognize the bridge’s importance and have been working to stabilize the structure, while at the same time, maintain its original form. However, planning is in the works to rehabilitate and restore the bridge to its original form, which is scheduled to start in July 2018 and expected to take 1-2 years to complete. After 40 years of neglect, the bridge will be reopened again, connecting the castle complex with the park. There are as many bridges at the Castle Complex in Glauchau as the number of castles itself. If counting the Hirschgrund Viaduct, a total of six bridges serve the the two castles that are jointly connected. There are two stone arch bridges that are part of the original Fordere Castle that was built in 1470 and is still considered the oldest Rennaissance castle in the region. Not much has been written about the castle’s history except for the fact that there were three periods of construction involving this Baroque-style castle: between 1470 and 1485, between 1520 and 1534 and in the 18th and 19th Centuries. The Hintere Castle was constructed in the 16th Century, and with that, there are three bridges- two connecting the two castles and one connecting the castle with the inner courtyard. The viaduct connected the castle complex and the park and was built last, having been completed in the 17th Century. All in all, the crossings served their purpose of allowing people to enter and exit the castles without having to worry about drawbridges over moats or even trying to ford the crossing. The crossings at Fordere Castle are only 20 meters apart, still though, they also serve as a good observation deck, where one can see much of Glauchau and its landscape as far as the eye can see. As the castles and the city center are on a high hill, that serves as a big advantage for tourists and photographers alike. 🙂 The crossings at Hintere Castle are inter-connected with the one to the courtyard being 25 meters away from the two enclosed ones, yet the latter provides a good view of the viaduct and the park. 🙂 The Castle Complex is still open for tourists and hosts several events, however changes are being made to make the complex more attractive. And with that the bridges will continue to serve the castle, just like in the Baroque Times. Also noteworthy of the tour in Glauchau are the crossings along the Flutgraben. The diversion canal bypasses the city on the west side, extending from the north end east of Jerisau Bridge down south to the Glauchau Reservoir, a distance of six river kilometers. 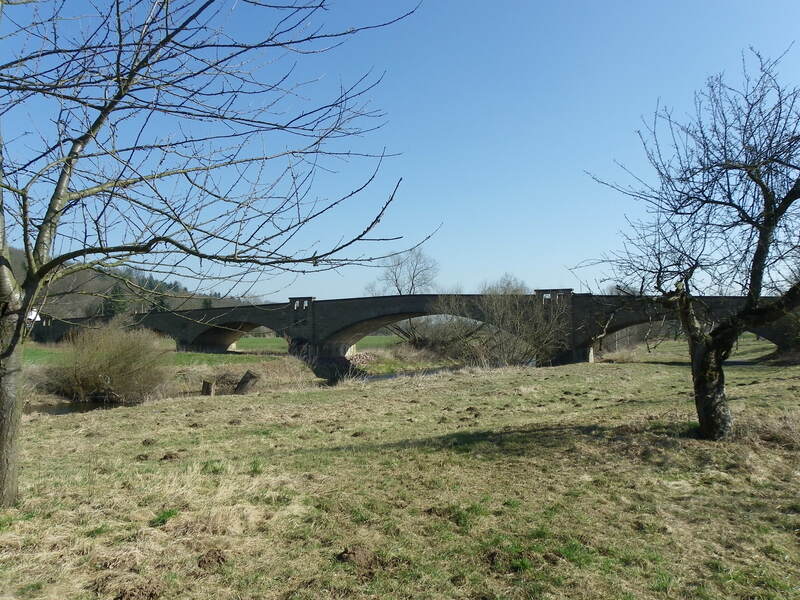 And while there are four crossings that are either as long or longer than the Scherberg Bridge, there is a sad history that is in connection with the Flutgraben. On 31 July, 1858, high water from the Mulde devastated much of the residential areas in Glauchau, causing enough damage to make the houses and apartments unliveable. It was afterwards that the city decided to construct a diversion canal, bypassing Glauchau to the west to alleviate the flow of water in the event of the flooding. Construction lasted until 1890 but not before having removed as many as seven dozen houses, buildings and other properties- many of them were empty or unliveable. The width of the canal is the same as the river itself, yet the flood plain is four times as wide as the canal, and with a depth of 3-4 meters, it would accomodate unusually high flows of water. At over 200 meters spanning the outer channel of the Mulde, the Nordufer Bridge is the oldest of the existing bridges along this channel. As a key link to Zwickau, it is also the busiest as 30 vehicles cross the bridge per minute. The 50+ year old bridge, which is characterized by its expansion and contracting rollers, has shown significant signs of wear and tear with cracks and spalling appearing on the girder spans. It is likely, given its approximate location near the industrial area and the Saxony International School, it will be replaced in the next decade. The structure carries Hwy. 175 which connects Glauchau with Zwickau. Located over the Flutgraben at the junction of Meeraner Strasse and Sachsenallee, this bridge was one of the first to have been built at this location after the diversion canal was built. After the Flood of 1858, the city council decided to construct the canal to divert water away from Glauchau, despite successful attempts by Heinrich Hedrich to construct the first drainage system in Germany serving the city. A wooden bridge was built to cross the area where the canal was being built, yet was replaced with a steel trestle at the conclusion of the canal project in 1890. The bridge featured a Bedstead Pratt pony truss bridge divided into three spans. That bridge was later replaced with a concrete girder bridge in 1949, which was later replaced with its current structure some 50 years later. 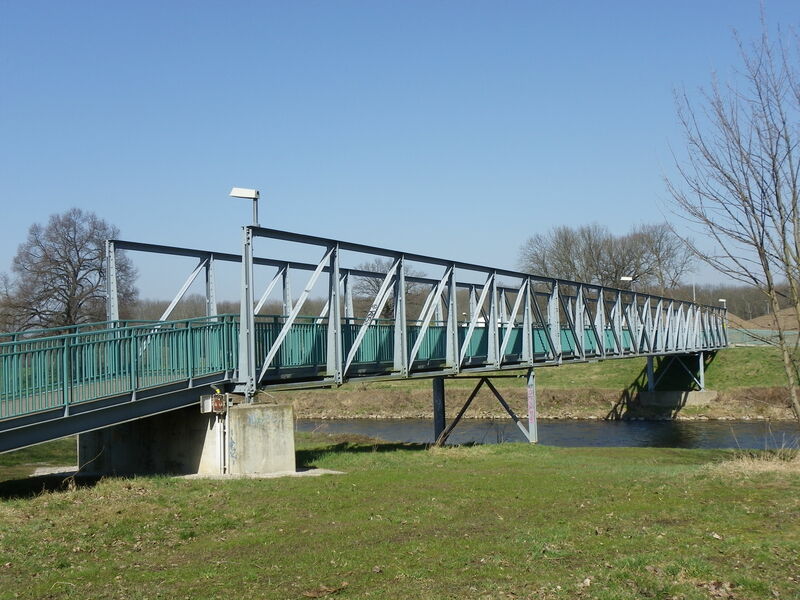 The cantilever deck bridge continues to serve traffic to Gesau and Meerane to the west and is located next to the sports complex where the soccer team Empor Glauchau has its headquarters. The bridge used to be called the Orphanage Bridge as there was an orphanage located near the site where the diversion canal was located. Built in 1859, the facility housed orphans for 150 years. Spanning the Flutgraben at the junction of Waldeburger Strasse and Hochuferstrasse (B-175 Bypass), this bridge connects Glauchau’s northern industrial district with the suburb Jerisau. Before the bypass was built, the bridge carried Highway B-175 through Jerisau enroute to Waldenburg, seven kilometers northeast of Glauchau. The Bypass was built to alleviate traffic and to provide better access to the Autobahn 4. The present bridge, a concrete cantilever span, was built in 1998, with a length of 97 meters- 15 more than its predecessor, a five-span concrete beam bridge built in 1949. This bridge may have followed the footsteps of the Meerane Bridge in terms of the types of bridges that had been built and replaced since the diversion canal was built in 1890. Located near the Glauchau Reservoir, this dam was built for the purpose of rechanneling the Mulde in the event of flooding. That means all excessive water flow through the dam and along the outer channel, alleviating the flow of water along the main river going through town without flooding it. Despite being built in the 1980s, sources indicated that a previous dam was built in the early 1930s, possibly replacing an even earlier one. When water is diverted towards the town, one can see some unique patters in the channel bed when little water is flowing, as seen in the pic below. The dam acts as a crossing, enabling cyclists and pedestrians to go in the direction of the southern countryside. Located over the Mulde at Wehrstrasse, west of Grundelteich, this bridge is one of the oldest in Glauchau, having been built in the late 1890s. This is recognizable with the cast iron railings and its approximate location to the mill and an unusual water silo. It is possible that this bridge was one of four built by Hedrich, but more information is needed to confirm these claims. The bridge was built in 1954 to replace a wooden bridge that had been washed away by flooding. 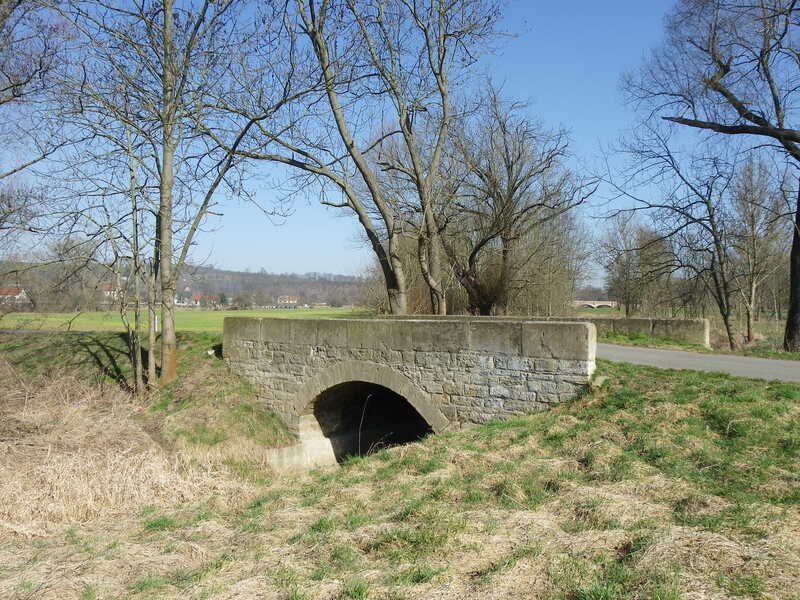 It was a simple beam bridge of six spans, built of concrete and steel, and had once been used as main traffic between the village of Wernsdorf and all points going to the south and west. 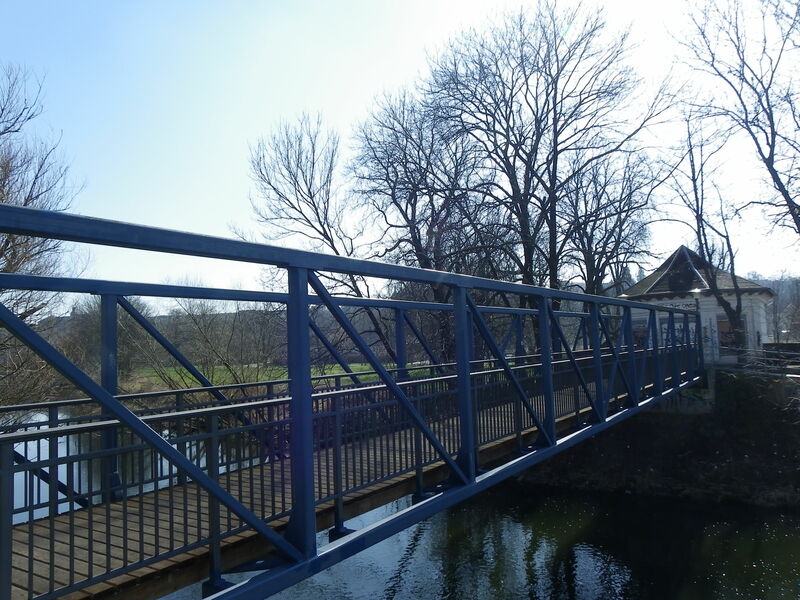 After sustaining damage by the flooding in 2013, the structure was closed to all traffic, and officials in Wernsdorf and Glauchau worked on a plan to replace the bridge as it served as a vital link, not just for cyclists and locals, but also for farmers. After the plan for a new bridge had been unveiled, the old structure was demolished in April 2016. Despite delays in finishing the project, due to unfavorable weather conditions and the construction of a new bike path connecting the structure with the sports complex, the bridge was dedicated to recreational traffic on 20 June, 2017. Currently, The Wave serves bikers, equestrians and walkers and is part of the Mulde Bike Trail network again, re-establishing a link between Glauchau, Wernsdorf and neighboring villages to the south. Author’s Note: This is a throw-back to an article I wrote for the blog version of the Chronicles in 2012. The difference here is this article features a map with a guide to the location of the bridges, so that you have an opportunity to visit them. In addition some articles about Flensburg are to appear in sister column The Flensburg Files soon, as some stories coming from there are worth having a look at. Flensburg, Germany: the city with lots of character. There are many factors that make the city, located at the German-Danish border unique. Given its proximity to the border, the city of 90,000 has the highest number of Danish minority living there with one in four having Danish blood. One will find many Danish stores in the city center and places to the north towards the border. The city prides itself on its local brewery, the Flensburger Beer with its 12 different flavors, which celebrated its 125th birthday this year. The city is the birthplace of rum, as the likes of Pott, Johannsen, Jensen and the like made their mark here, many of which can be seen by touring the Rum-Sugar Mile. One can tour see and learn about the ships that were built in Flensburg, let alone travel the Alexandra, the lone coal-powered ship still in operation. And if one is interested in sports, there’s the handball team, SG Flensburg-Handewitt, one of the premiere powerhouses in the Bundesliga. Schleswiger Strasse Brücke- When getting off the train at the station, this is the first bridge you will see. Spanning the railroad line connecting Flensburg with the key points to the north and south, the two-span arch bridge is the second crossing at this site, for the first bridge was built in 1854 when the rail line was first constructed. This bridge was built in 1926 and still retains its original form. One should not be mistaken by the fact that the bridge is brand new. It has shown some wear and tear especially on the inner part of the arches. But overall, the bridge is in excellent shape and is in the running for being declared a historic landmark by the city. Peelwatt Viaduct- Spanning the railroad line connecting Flensburg and Kiel, this viaduct was built in the early 1900s and is the tallest and longest bridge in Flensburg. The bridge is about 70 meters long and 30 meters deep, carrying Kaiserstrasse. This bridge was difficult to photograph given the number of thorns that had to be dealt with, in addition with being chased by a large Rotweiler owned by a couple having an “open air concert” during my visit in 2011. Unless you’re Nathan Holth and want to deal with scratches and bruises, this stunt should not be attempted. While the bridge had seen its better days because of cracks and falling debris, the structure was recently rehabilitated in a way that a new roadway and railings were built, making it safer for cyclists to cross. Since finishing the work this year, the bridge has been serving as an important link between the campus of the University of Flensburg and the City Center. Angelburger Brücke- Located at the junction of Angelburger Strasse and the main highway Sudenhofendamm, this bridge has a history in itself that required a lot of researching. When I visited the bridge in 2010, the first impressions that came to mind was that it was just a girder bridge with some ornamental railings resembling an X-shape. Underneath the bridge it features V-laced truss framing that is welded together with gusset plates. But beyond the engineering facts, if one looks more closely at the abutments, one can see the remnants of a bike shop encased into the bridge’s north abutment because of the old German lettering and a wheel resembling an old-fashioned bike from the 1930s. As the nearest bike shop was up the hill at Hafenmarkt, I sent an inquiry about this bridge after writing a mystery bridge article about it. The response was an interesting one. The shop inside the bridge was indeed a bike shop owned by the Kraft family, which housed not only bikes, but also a repair shop. That remained in business through the 1960s before being replaced with a store that sold used books and comic booklets. It was owned by Emma Voss. Shortly before its abandonment in ca. 2000, a used furniture store took its place. After sustaining damage through broken windows and other forms of vandalism, the windows were bricked shut and a bilboard took their place. However, according to the Petersen Bike Shop, who provided the information, the city is looking at revitalizing the Bahndamm which would include remodelling and reusing this unique store space. Whether and when this will be realized remains to be seen. The bridge was built in 1919 as part of the Bahndamm line connecting the harbor and the train station. It is used next to never these days. But with the revitalization plan on the table, that might change as well. Bahndamm Bridges: Located at the junction of the Hofenden and Hafendamm, the 1919 bridges feature not only one, but two bridges built next to each other. Each one carries a rail line just west of the split with each one caressing the harbor. Once used to transport goods from ships to the main land, both lines appear to have been abandoned for a couple decades or have seen little use. The bridges themselves are plate girder with V-laced bracings at the bottom. Its future however seems uncertain as they pose a hazard to vehicular traffic. A traffic light is right after the bridge and the lanes have become a problem, even though the city council has tried to fix it most recently. 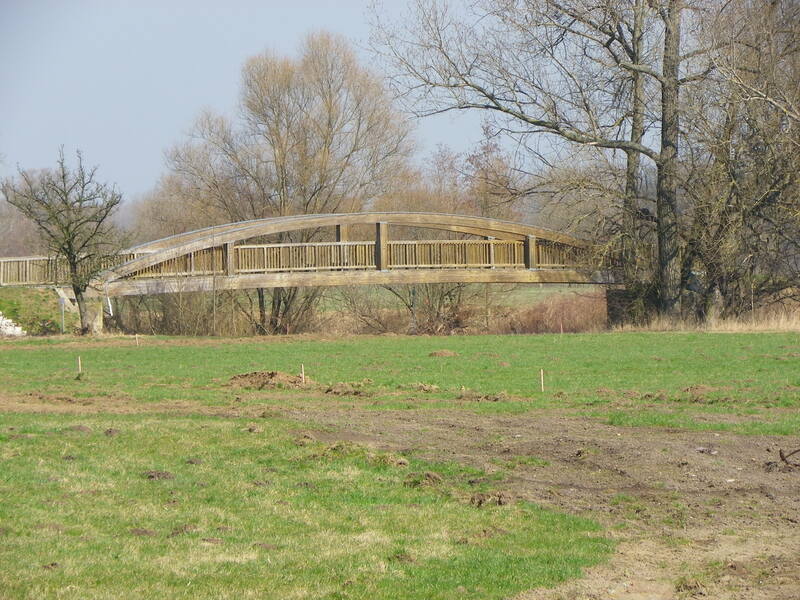 Bridge of Friendship: This bridge is the northernmost structure, as it is located at the German-Danish border at Wassersleben, carrying a bike trail which leads to Kursa. It is also one of the most unique structures in Schleswig-Holstein for it is not only made of lumber, but the truss design is unusual- a Queenpost deck truss but designed in a manner similar to a Queenpost pony truss- the diagonal beams connect the piers with the decking without meeting at the center. Built in 1920 but reconstructed in 2003, the BoF has symbolized the connection and friendship between Germany and Denmark, which has been that way since the 1950s. Yet up until World War II, the relations between the two countries were not always the best, as they fought each other over the lands extending from Schleswig up towards Kolding- the region known as Angeln. Yet the Battle of Dybol (near Sonderburg) in 1864 decided the border in favor of German empire, with Flensburg becoming a border town. With the exception of World War II, when Hitler invaded and conquered Denmark, the border has remained the same. Between 1945 and 1995 Danish and German guards stood at the bridge, ensuring that people can cross without incident, especially as each country had its own set of laws. Yet after the Shengen Agreement, the border bridge became a free crossing and has remained so ever since. One can see the empty border patrol station still in place today when crossing into Denmark. Bahnhofstrasse Brücke: Located just north of Carlisle Park on the road heading to the train station, this 1919 railroad bridge features similar lattice bracing as the Angelburger Bridge but in the form of a snowflake. The bridge was part of the rail line connecting the train station with the harbor but has been unused for the most part for a couple decades. 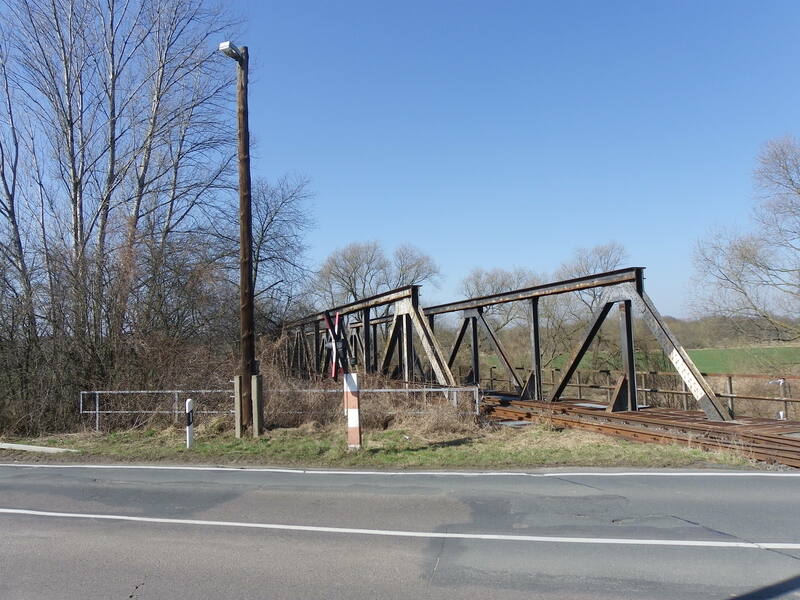 Tarup Railroad Bridge: While this bridge may look like a typical deck plate girder, this 1903 bridge is located in the rural village located 8 km east of Flensburg. Interesting to note that there is a restaurant located 300 meters away from the bridge with the date saying that the railroad was in service from 1903 to 2000. Yet the information seems to be mistaken, for the bridge carries a rail line between Flensburg and Kiel, with trains running on the hour. It is possible that the train station in Tarup was discontinued in 2000 forcing many to board at either Flensburg or Husby, but more research is needed to prove that. Lautrupsbachtal Viaduct: The last bridge on this tour is this one. Built in 2009, the bridge spans the Lautrup Creek and several other smaller streets and a bike trail in the village of Lautrup in the eastern part of Flensburg. Despite a debate about the construction of the bridge, the it has served as a blessing, carrying traffic around the eastern end of the city, reducing the congestion, which is still a recurring problem in the city center. The bridge is the longest, measuring 500 meters, and presenting a curve. The railings also serve as a noise barrier- 10 meters tall, resembling the Ecu Viaduct in Geneva, Switzerland. A video of the crossing is presented here. There are some more bridges that are worth visiting but could not be put on this page. Yet another bridge photographer, Fritz Wissemborski also took a tour through Flensburg in 2003 and has a set of pictures you can view here. It pretty much sums up how important the bridges were to the city of Flensburg, for it contributed to the development of its infrastructure over the years. And because talks are underway to convert the former rail line to a bike trail connecting the harbor with the train station, one will have an opportunity to see these bridges reused again, as more and more people will take to the bikes and leave their cars in the garage. This way people will know more about these structures and come to appreciate them even more than they did in the past, providing another reason to visit Flensburg apart from the rum, beer, boating and handball. Click on the highlighted bridges to gain access to the photos. Some of which were photographed by the author and can be found on his facebook page.